Clear and coloured glass with painted details. Like much other medieval stained glass, this window has been displayed in a number of locations during its history. It may have originally been produced for the Romanesque Cathedral of Troyes, which was destroyed by fire in 1188, but it is also possible that it could have been from another building nearby - the collegiate church of Saint-Etienne. By the nineteenth century the window had been installed in the Lady Chapel of Troyes Cathedral, which had only been built in the thirteenth century. The window is likely to have been removed from the Cathedral during renovations(1849-1866) when much of the glass was dispersed. The Devil is shown carrying Jesus Christ up onto a pinnacle of the Temple in Jerusalem. Here he said, 'If thou be the Son of God, cast thyself down: for it is written He shall give his angels charge concerning thee: and in their hands they shall bear thee up, lest at any time thou dash thy foot against a stone' (Matthew 4: 5–6). Christ to the left, with a book in his hand. He is being carried by Satan who is represented as a green demon with snakes coming out of his head. The temple is seen to the right. Border of yellow, green and blue foliage pattern. (1188) Romanesque cathedral at Troyes destroyed in a fire. (1208) Bishop Hervé begins the rebuilding. By the time of his death in 1223 the choir was completed except for aisles and chapels. (1849-1866) Renovations in the cathedral. Much of the glass was dispersed and those that survived were subsequently dispersed. It has been considered that these panels (C.105-108-1919) were made for the Romanesque Cathedral at Troyes; they survived the fire and were re-used in the new Cathedral, with additions of borders to make them fit the new window openings. It has been believed that they were put in the Lady Chapel sometime after 1223. This assumption was based on three 19th century descriptions (see Arnaud, Guilhermy and Fichot) describing the panel in the cathedral. More recent opinion suggests that they could have come from another church in Troyes, perhaps from St-Etienne; still dating from c.1170-80 with 13th century additions. Little (see bibliography) conjectures that the panel was originally in the Collegiate Church of Saint-Etienne in Troyes. This is based on the size of the panel and a reconstruction of the entire narrative window from the surviving panels of the cycle. The proposed reconstruction and the measurements (albeit from little surviving evidence) would fit the narrow axial lancet chapel windows at Saint-Etienne). This panel along with Museum number C.107-1919, panels in the Musée Cluny in Paris and Montreal formed part of a Temptation of Christ window. The Montreal panel shows Christ seated upon the Temple with the devil tempting him to throw himself down. The Cluny panel shows Christ ministered to by angels after the third temptation. The panels had been on loan from J. Pierpont Morgan Sr. from 24 January 1910. (Matthew 4: 5-6) If thou be the Son of God, cast thyself down; for it is written He shall give his angels charge concerning thee and in their hands they shall bear thee up, lest at any time thou dash thy foot against a stone. 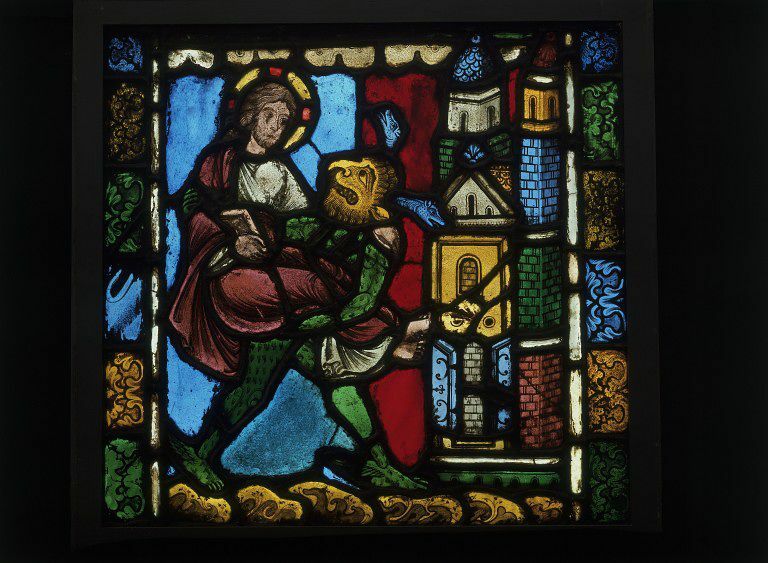 The image on this panel shows the devil carrying Christ towards the temple. This is the first stage of the Second Temptation (as recorded by Matthew) or the Third Temptation (as recorded by Luke) in which they say that the devil brought Christ to Jerusalem and then set him upon the pinnacle of the temple. The more usual representation of this temptation is that of Christ seated upon the pinnacle of the temple. There is another panel, in a private collection in Canada, showing Christ seated on the pinnacle which Little (Gesta, 1981) states is the second part of this panel. - the story of the Temptations of Christ are recorded in some depth in the Gospels of Matthew and Luke and referred to in passing only in Mark. The taking of Christ up to the top of the temple and challenging him to thrown himself down. The taking of Christ up a mountain and offering him dominion over all the kingdoms of the world. Little makes reference to an illustrated psalter from Paris, dated to about 1200, which shows the temptations in an expanded format. Arnaud's descriptions of these panels in 1837 only record the usual scenes but with one addition - a scene of Christ with a vase full of gold and silver coins at his feet (the whereabouts of this panel is not known). For this Temptation series, Little proposes a 6-scene window and suggests that the whole window would have been too small for the openings in the pre-fire Romanesque cathedral at Troyes and so believes that these panels were probably originally in a smaller church. 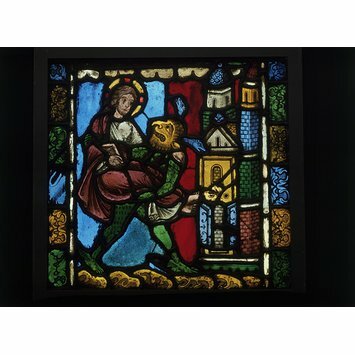 Panel of clear and coloured glass with painted details depicting part of the Second Temptation of Christ. France, Troyes, 12th and 13th centuries. Possibly originally from the Collegiate Church of Saint-Etienne, Troyes.